Mirror mirror on the wall, who's the pinkest of them all? Travelling in the UK isn't so bad with candy vibes like these. 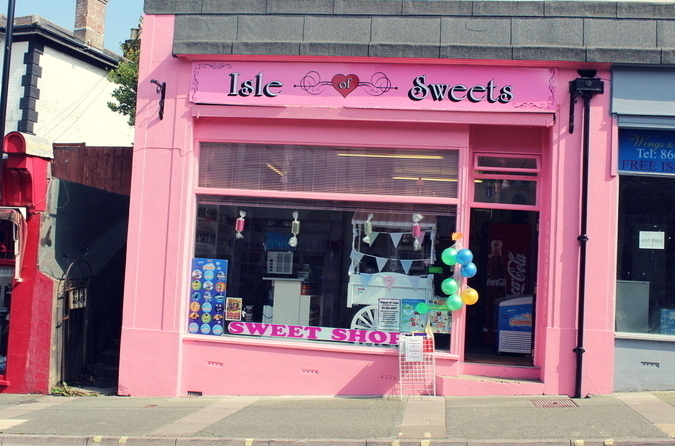 This sugarlicious sweet shop caught my eye during a trip to the Isle of Wight last year and I couldn't pass up the promise of thinking pink and getting my ice cream dress out for a serving of candy cuteness. It was a bit awkward getting photos (hence the tight lip trip) as the shop's on a main road with lots of cars whizzing past. Ugh. But still PINK PHOTOS. Worth it. Do you reckon this is where Barbie does her grocery shopping? I srsly wouldn't be surprised. Now my next mission impossible is to find a hotter pink place than this that packs an even more powerful punch. Hot on the heels of our pink ferry fairytale, I'm on the lookout for new photoshoot backdrops. I'm in the mood for magenta. Wish me luck in my pink ventures, I'm going to need all the dreamy detective vibes within me! You can read my full post on our trip to the Isle of Wight here, let's just say Shanklin is full of sugary sweet surprises and is a real gem of a place to stay. Whilst we're on the brink of all things pink, did anyone else love a bit of Pink Panther when they were growing up? I remember it being on TV during the Easter holidays but never caught much. Graham and I retrieved the boxset from his storage the other day and watched a few episodes. Verdict? Cute but a bit horrific when other colours came into play. Less orange and blue, please. I'm also holding out for an episode where he slips into a pink jacuzzi and sips on a pink martini. In other news, I have to give the movie Girls Trip an honorary mention - has anyone else caught it at the cinema yet? Mum and I have seen it plenty of times, it's a total gem of a movie and full of laughs and fun, I'd definitely recommend. Seems like it's gone down a hit too, it's always been packed when we've gone to see it and it seems like us girls finally have something to watch aside from all the action blockbusters, yassss. This ice cream print dress from Rare London was a hit last year and I'm already craving another outfit post opportunity with it. Graham and I are hopefully venturing on a little pink tour of London soon, although I don't think I'd have the courage to hit up London in this, keep your eyes peeled for more colour poppin' paradise on the blog before too long. Are you a pink lover? Have you found any cute places lately? Love this bright outfit! You can never go wrong with pink! You look amazing! This dress is so cute! I love the print and pink color...beautiful! Yes I adore pink, and I quit it for a while because I wanted to be rebel against what everyone considers a girly color because I wanted to prove I was strong. Now I know that being girly is okay and doesn't mean you aren't strong, or that there isn't a special power to it! You know, we girls, women, ladies have are so strong and powerful, can't let a color define our strength. So yay pink!!!!! Love the ice cream prints on your dress! It is super cute! You dress! *GASPS* It's so cute! That dress is super cute and also these shoes are perfect for this outfit! You look beautiful, love these pictures! Such a cute outfit! I love prints like this. One of my favorite dresses from your wardrobe, sugar!! This pink backdrop is incredible, cannot go wrong with such a sweet shop. Wishing you the best of luck searching for that magical magenta vision!